Patterning it up! This piece is a guilty pleasure. I know my pattern arsenal is almost all food related, and probably 80% of that is desserts. 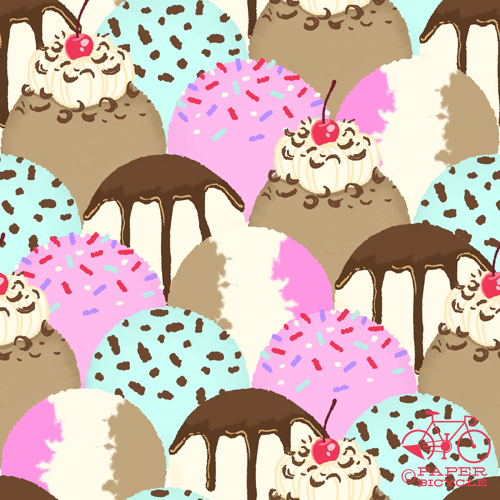 Ice cream is so cute and pretty, though. My sister and I used to have a collection of dolls that had dessert-themed clothes and furniture. I was thinking of the banana-split vanity when I made this one. Jeez! You're a pattern maniac! Like Zack, Zack the Lego Maniac! But instead it's Francesca the Pattern Maniac! oh man now I want icecream! Love this one!